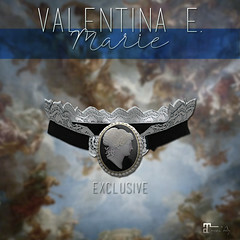 January 2018 – Valentina E.
NEW! Valentina E. Enchanted Ensemble @ The Epiphany! 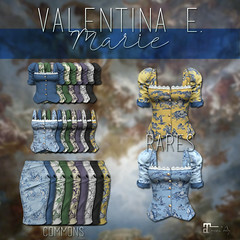 Out now at The Epiphany the new Valentina E. Enchanted Ensemble GACHA! Play for these gorgeous gowns and stunning, theatrical cloaks, both in a variety of colors and finishes. The fatpack of coordinating tassel belts can be won with points! Demo available at the event and at our main location. Have fun playing! NEW! Valentina E. Elle Military Jacket @ The Chapter Four! Out now at The Chapter Four the new Valentina E. Elle Military Jacket, exclusively for Maitreya Lara! Featuring loads of details including metallic buttons, gold cord, and even some medals (for heroism, naturally), these cool jackets look fantastic with vintage jeans. Demos available. Just 50 L a play. Don’t miss it! NEW! Valentina E. Belinda Dress @ FaMESHed! NEW! Valentina E. Belinda Dress available in 9 color options for Maitreya Lara, Slink Physique/Hourglass, and Belleza Isis/Freya. Demo available at our main location and the event.